The ad agency for a Maryland based real estate developer contacted Randal Birkey as the result of a web search. The agency required a map of the downtown area of Bethesda, Maryland, on which to locate many area amenities for a print brochure on a proposed new high-rise condominium project. 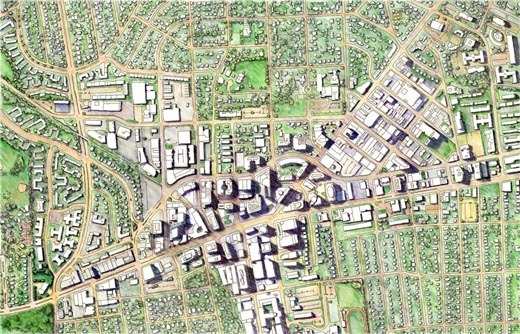 Randal created this digital watercolor map using aerial photography as a reference point. He used an Apple Macintosh computer running a software program called Painter (now a Corel product). Digital “Watercolor brushes” were controlled using a Wacom tablet connected to Randal’s computer. The final files were formatted and prepared in Adobe Photoshop, and delivered to the customer via email.